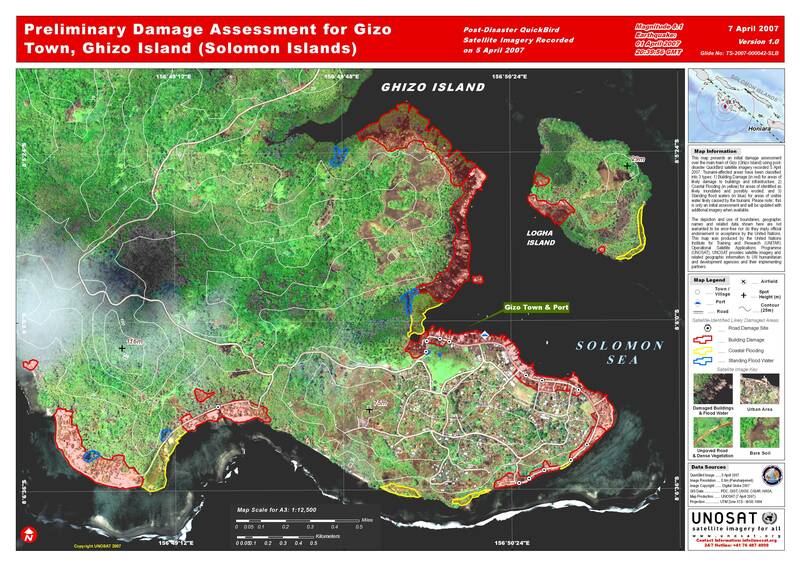 This map presents an initial damage assessment over the main town of Gizo (Ghizo Island) using post-disaster QuickBird satellite imagery recorded 5 April 2007. Tsunami-affected areas have been classified into 3 types: 1) Building Damage (in red) for areas of likely damage to buildings and infrastructure; 2) Coastal Flooding (in yellow) for areas of identified as likely inundated and possibly eroded; and 3) Standing flood waters (in blue) for areas of visible water likely caused by the tsunami. Please note:: this is only an initial assessment and will be updated with additional imagery when available.